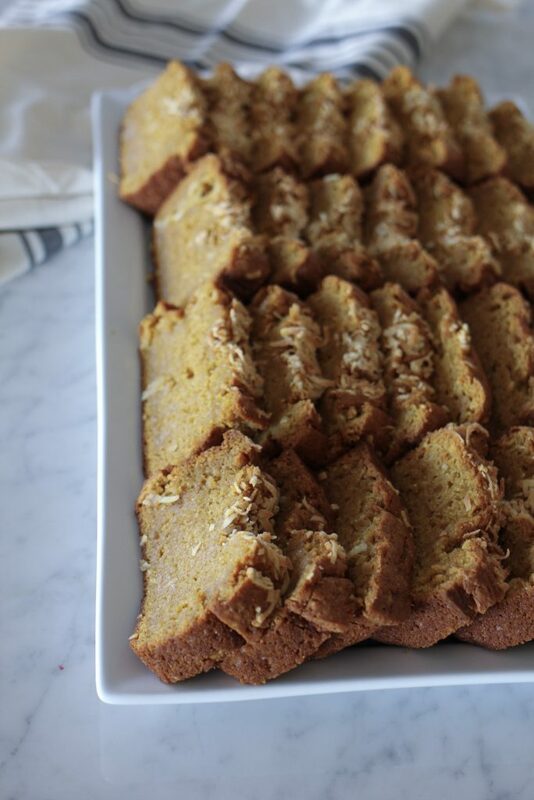 Coconut Pumpkin Bread. It’s one of the best fall desserts I have ever eaten! 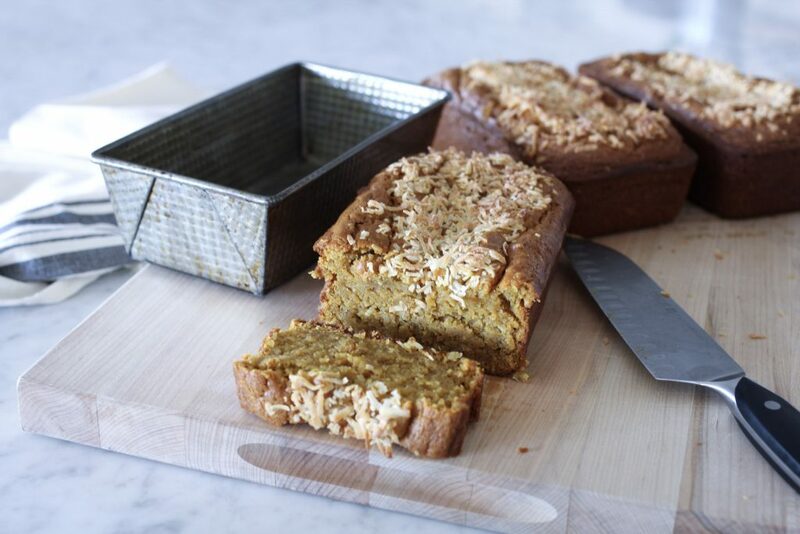 It actually qualifies as a quick bread, so Coconut Pumpkin Bread is perfectly acceptable to be served at breakfast or brunch. You have my permission. The combination of pumpkin and pudding make this bread unbelievably moist and rich. Last Saturday it was 90 degrees. Today it SNOWED at my house. Lightly, but it did snow. I took a drive up to Park City this morning. And it was an all-out blizzard up there. Snow in the first week of October sends me into baking mode. 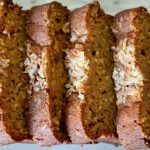 I love to change up the normal and this recipe includes a combo of pumpkin and coconut and pudding in the batter to make a super moist pumpkin loaf. It’s so good all by itself or with a scoop of vanilla ice cream. One recipe makes two very dense loaves, which usually produce about 8 thick slices. It freezes well and can be made days ahead and stored in the fridge until you are ready to slice and serve. I’ve made several loaves of coconut pumpkin bread in the past week. I love it because it’s a little change from the usual pumpkin bread varieties of either chocolate chips or raisins. It’s always a big hit in our house. This recipe was given to my by my dear friend Tessa and has been a family favorite for years. Preheat oven to 325 degrees and set oven racks on bottom third of oven. Line and grease 2 loaf pans. Beat eggs and oil together in large mixing bowl. Add pumpkin. Mix well. Add all dry ingredients; mix until all ingredients are incorporated. Pour ingredients into prepared loaf pans. Sprinkle tops of leaves with coconut, press in slightly. Bake at 325 degrees for 1 hour, or until toothpick inserted in center comes out clean. Let cool for 10 minutes, then remove to rack and let cool completely. -You may add 1/4 cup of coconut to batter if desired.-If you are unable to find coconut pudding, purchase vanilla pudding and add 2 teaspoons coconut emulsion or 1 teaspoon coconut flavoring to the batter. Coconut emulsion may be found online at Amazon or in baking supply stores. 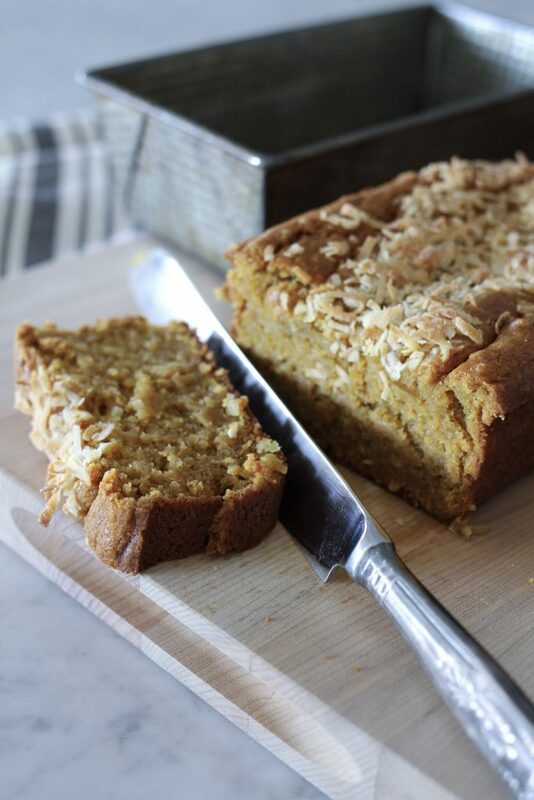 I love the idea of adding coconut to pumpkin bread. Thanks for the inspiration! Coconut and pumpkin may not have the right ring to it but judging from the recipe and the photos you posted, I think they're a match made in heaven. Can't wait to try this! This looks scrumptious and the pictures are beautiful as always! I think I need a slice of it in my left hand and a big glass of milk in my right! ah Si this was amazing!!! me and my family loved it! (: me and my mom wanna come try out one of your cooking classes soon!! 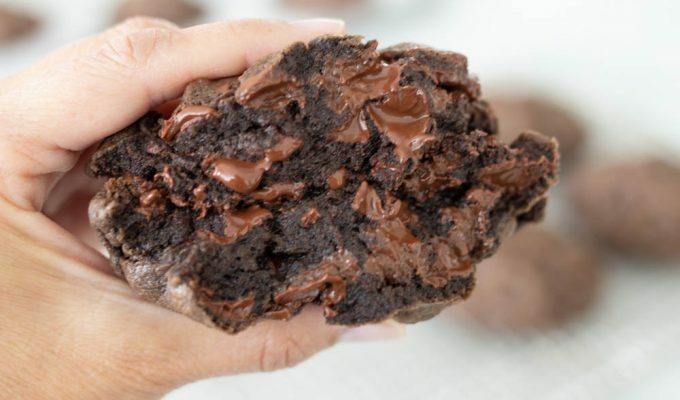 Only one word needed: yum. Can this recipe be split into mini loaf pans instead of the standard size? Hi Brianna, Yes, after lining and spraying the pan, fill pans about 3/4 full. The cooking time may be reduce a bit as well with smaller loaves.